Nature documentary series looks at marine invertebrates, some of the planet's most bizarre and beautiful animals, including Humboldt squid and giant octopuses. Browse content similar to Creatures of the Deep. Check below for episodes and series from the same categories and more! and an inhospitable place for those of us who live on land. Today, descendants of those early life forms continue to thrive. They share the sea with fish, but outnumber them by ten to one. and have evolved into countless different forms. Some are huge, large-brained and intelligent. yet build the largest natural structures on the planet. They are marine invertebrates, the creatures of the deep. to the problem of staying alive. The ocean is by no means uniform. from cracks in the Earth's crust. the ancestors of all life may have evolved in a place just like this. So named for their ability to survive volcanic heat. They share the vents with crabs and two-metre-long tube worms. that thrive around the vents. These colonies are extremely rare. nearer the surface, where feeding is considerably easier. These are krill, tiny shrimp-like crustaceans. Swarms can reach astounding numbers - 60,000 per cubic metre. During the night they rise towards the surface to feed on plankton. from humpback whales to shoals of predatory fish. It's one from the deep. Two metres long, they have a local reputation as man-eaters. They are highly intelligent hunters. Their eyesight is exceptional. and a razor-sharp beak for tearing through flesh. and so group together for safety. herding the fish against the rocks. but also to signal to each other when they are about to attack. Humboldt squid numbers are growing rapidly. As fast as they arrived, they disappear back into the deep. 800 miles from the South Pole, in the shadow of a smouldering Mount Erebus. Winter temperatures are a punishing minus 40. This, perhaps, is the last place you might expect to find marine life. light reaches the sea beneath the ice. so conditions are not unlike those of the deep ocean. Yet, in McMurdo Sound, life flourishes. The creatures here grow extremely slowly. and they occur in surprisingly large numbers. and urchins carpet the sea floor. and is constantly scanning the sea floor for food. may only arrive once in ten years. But a seal's body won't be easy to eat. that enables them to puncture the skin of the corpse. It's harder work for the sea stars. They feed by pushing out their stomachs through their mouths. it secretes digestive juices that dissolve the seal's tissue. until all that remains of the seal will be a skeleton, stripped bare. The shallows are only a tiny part of the marine world. 90% of it is open water. Its currents carry life for thousands of miles. The masters of this nomadic existence are jellyfish. but not for this jellyfish. Swarms like this are not accidental. when the temperature and currents were just right. of feeding on a late-summer plankton bloom. Jellyfish have no brain and no blood. But they do have eyespots that enable them to tell the difference between light and dark. by a simple form of jet propulsion. 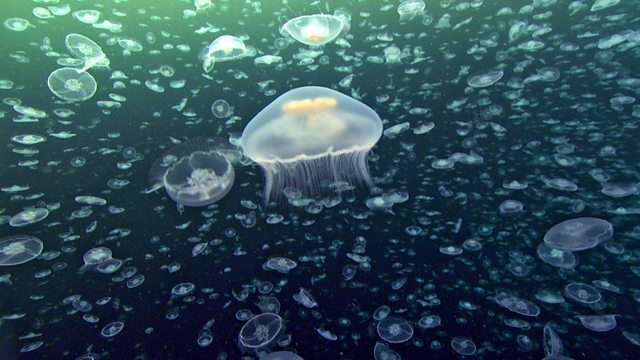 All jellyfish have stinging tentacles with which to catch their food. which is then passed towards their mouth in the centre. ..but not for this one. A huge fried egg jellyfish. Its weapons are harpoon-like cells that cover its tentacles. When they come into contact with a victim, they spear it. The fried egg then hauls in its prey. A few lucky Aurelia do manage to pull themselves free. They are protected by stinging cells. But there are other kinds of defence. They spend most of their lives in deep water. a quarter of a million crabs set off on a long journey to the shallows. They are here because they all share a problem. Each crab has been wearing the same suit of armour for a year now. And it's getting uncomfortably tight. Replacing an old shell is understandably a tricky process. ..before gingerly backing itself out. The spider crabs are not only here to moult, but to mate. And they grab the opportunity with considerable enthusiasm. Coming together in such numbers does however have a drawback. the stingray seems to ignore them. are prepared to rely on it. Alarm spreads amongst the crabs. But in fact, most of them are safe. This ray is being very choosy. Once a target is singled out, there is no escape. leaving behind only their old, empty shells. Like spider crabs, the behaviour of most marine creatures is controlled by a very simple nervous system. This cuttlefish is one of the cleverest animals in the ocean. She has a very large brain. In fact, it's larger for her size than that of most fish or reptiles. Her life is both complex and full of intrigue. but once in their short lives they must come together to mate. one of the largest males starts to show interest in her. a place where she will be able to lay her eggs in safety. to an opening near her mouth. standing guard until she's laid her eggs. But he's got a problem. Males outnumber females four to one. So keeping her to himself is a constant battle. This larger rival is more difficult to intimidate. in order to signal their moods. tell the rival to keep off. Most rivals back down at this stage, but not this one. in the end, he has no choice but to fight. Victory! And the male can return to guard his female. they can also be masters of deception. mimicking a female that wants to mate. he changes colour to appear even more like a female. another female to add to his conquests. edges closer and closer to the female, holding his nerve. As long as he avoids being grabbed in a mating embrace, the sneak is safe. right under the larger male's tentacles. It's time for the female to lay her eggs. and glues them to a rock in a hidden crevice. With luck, she will now have a mix of offspring. Some may become masterful males, and others, little sneaks. She'll have all the bases covered. The coastal waters of British Columbia. Home to this four-metre-long Pacific Giant Octopus. She is a formidable predator, but at the moment hunting isn't on her mind. She has just mated for the first time. And now she's searching for a safe refuge. She makes her choice carefully. This is going to be her home for many months to come. and she's guarding them with her life. ensuring that algae don't grow on them, and that fish don't eat them. so they're well-supplied with oxygen. and during all this time, she doesn't eat a thing. she jets water over them for the last time, helping them on their way. This will be her final act. and to give her young their best chance, she sacrifices her life. Out of the depths comes one of the largest and most aggressive starfish in the ocean. a giant sunstar the size of a dustbin lid. that can detect prey by touch and smell. and it detects the carcass of the giant octopus mother. and drag it out of the cave. Other scavengers rush to join the feast. Pycnopodia doesn't have it all its own way. but they do have a formidable defence. pinching the starfish's probing arms. Pycnopodia is spotted by an enormous king crab. and within seconds, the crab rips off one of its arms. But that is just a temporary inconvenience. Starfish are able to quickly regrow a lost limb. but in fact it's some of the smallest that can make the biggest impact. and it all began with creatures smaller than a pinhead. it needs something to give it a firm footing. A wreck like this provides an excellent foundation. plankton, carried here by ocean currents. The larvae must attach themselves to the wreck. Once there, they can develop into young corals called polyps. and there is lots of competition from other invaders. and that's a problem for the young coral. The polyps are in danger of being eaten before they've even got a proper foothold. the survivors can go on to build a reef. Too deep, and not enough light will reach the corals for them to grow. Too shallow, and they risk being exposed to the air at low tide. it also needs to be in the path of currents carrying food. of corals visible to the naked eye. A decade later, and the wreck will be transformed. Thousands of polyps will form coral heads that encrust its surface. and there has been enough time for a substantial reef to develop. different species of corals dominate particular areas of the wreck. reaching far out into the water, and up to the light. crammed with polyps, to gather as much light as possible. are better suited to the heart of the developing reef. It's these that give the reef their structure and permanence. each striving to win a foothold on the rusting hulk. that it's hard to imagine that there is any conflict here. But, as night falls, the mood on the reef changes. and will fight to the death to expand their territory. a winner will, literally, eat its enemy alive. long thread-like filaments, over their opponents. The coral that can digest fastest, wins. building a bigger and bigger reef. in a mass spawning event. and join, to develop into larvae that drift in search of a place to settle. Eventually, every inch of the wreck's surface will be colonised. The steel will rust away, and the reef will be on its own. Most reefs grow without the help of a wreck to start them off. the Great Barrier Reef, the largest living structure on Earth. A coral reef rivals even a rainforest for its diversity of life. Yet corals like this are found in waters where food is very scarce. and highly specialised way to gather every nourishing scrap. swirling out and grabbing food particles with their feathery gills. Coral barnacles are, in fact, related to lobsters. waving their feet to gather any food floating past. Crabs have evolved many different ways of gathering food. This porcelain crab has a fan of filaments on his front legs. A boxer crab attaches a tiny sea anemone to each fist. in this case, perhaps just a bit too sticky! This strange creature is a sea cucumber. It uses its tentacles to grab food from the sediment. like these nudibranchs, or sea slugs. Their vibrant colours are a warning that they're toxic. There are over 3,000 species, many hunt just one specific prey. This emperor shrimp makes the most of the poisonous nature of its host. But, it's a rather one-sided affair. As it feeds, the shrimp gets protection and a free ride. Other shrimps have developed a more balanced relationship. Some even solicit for partners. These dance for their dinner. that they are open for business. including those that could happily eat them. In return for their bravery, they get a meal that comes to them. occupy less than half of one per cent of the ocean's floor. Yet they support a quarter of all marine species. make up the majority of life in the oceans. of Asia, Europe, and the Americas. they have, literally, changed the world. the Life team had to take underwater filming into uncharted territory. A sunken ship can make an ideal location for corals to grow. to make their very own shipwreck. they find a boat in the Bahamas that might be suitable. But there's a lot to do before it can be sunk to the sea bed. Apparently it's been here for eight years on the jetty. and it's all hands to the pump, Ian. We've got to get a pair of overalls. The team have to put away their cameras and get their hands dirty. and I'm trying to clean it with a paint scraper! and ensures it won't pollute the sea. It's like Changing Rooms, isn't it? there's no guarantee that she'll even float. Well, we actually... we do have some holes. and they've been doing a brilliant job. That's the last bit, OK, guys. Vamos! Well, she's clean, she's been inspected, and she's ready to be sunk. the team are forced to put their plans on hold. Luck doesn't seem to be on their side. But, two days later, good weather returns. Here comes a crane, finally! Fingers crossed, arms crossed, legs crossed, everything's crossed! or they won't reach the chosen wreck site before nightfall. She's safely in the water, so far, so good. to film her sinking below the surface. We've spent a week preparing for this, and finally the afternoon's arrived. But the light's going, so we have to move. ready to film her descent, while the support boat moves away to a safe distance. There's nothing more to do, but wait. Here we go, look at this! She gently comes to rest, and the right way up, just as they'd hoped. Now, it's time to let nature take its course. The crew will be back over the next two years to see how life takes hold. that it'll be colonised by coral. With luck and time, it'll eventually become a full-scale reef. the Life team's challenge is very different. Here in Antarctica, just getting underwater will be tough. at the McMurdo polar research station. to prepare them for any situation. A colleague lost in a whiteout is very serious. This training might mean the difference between rescue, or not. the bucket so you cannot see at all, and it does actually work. It's just... You can't see anything in this. ready to go beneath the frozen surface of the Ross Sea. needs the help of McMurdo's specialist drilling team. a specially designed hut is slid into position. This will be the team's base for the next four weeks of diving. the door to another world. must come in and out of this hole. This is as far south as it's possible to dive. to see just what it's like underneath there. Doug and the team venture below the ice. but it's the animals they've come to film. So, specialist time-lapse cameras are moved into position. The animals move very slowly at these freezing temperatures. the team hopes to reveal the behaviour of these creatures for the first time. Oh! That is amazing. It is so beautiful down there. hanging down from the top of the ice. just an amazing profusion of life. Really lovely, totally unique, unlike anywhere else. so can you give me a hand up, please? Thanks. before the sequence was eventually completed. Marine invertebrates are some of the most bizarre and beautiful animals on the planet, and thrive in the toughest parts of the oceans. Divers swim into a shoal of predatory Humboldt squid as they emerge from the ocean depths to hunt in packs. When cuttlefish gather to mate, their bodies flash in stroboscopic colours. Time-lapse photography reveals thousands of starfish gathering under the Arctic ice to devour a seal carcass. A giant octopus commits suicide for her young. A camera follows her into a cave which she walls up, then she protects her eggs until she starves. The greatest living structures on earth, coral reefs, are created by tiny animals in some of the world's most inhospitable waters.